Humor and wit are the house guest of Psychonaughts. 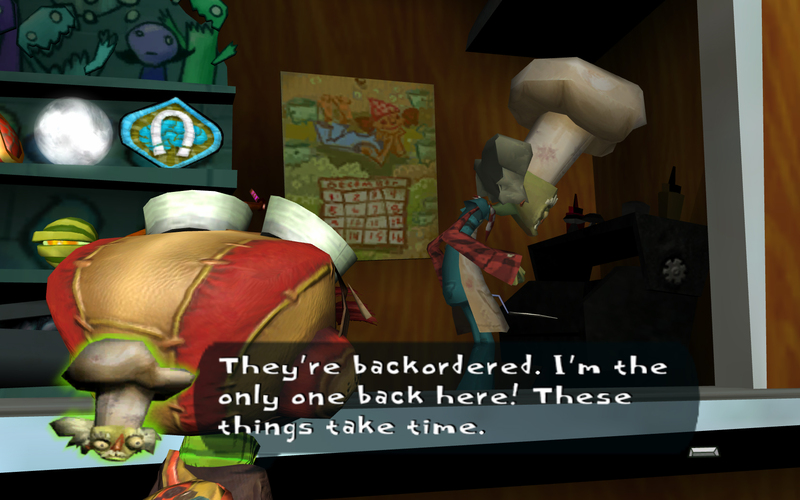 Platformers in the past could survive just on their gameplay, hopping around with any number of powerups, but I don’t think Psychonaughts would have been half as good if it wasn’t for the richness of the jokes, and the zany world where it can make partial sense. It does stay true to its roots, keeping plenty of jumping and powers, but brings that extra depth that you can't get from a non-speaking protagonist. I bought the game for $2.00 during a Steam sale. I heard it was good, and like most of my other reviews, I bought it on the opinions of others. Now it is time for you to hear my opinion. 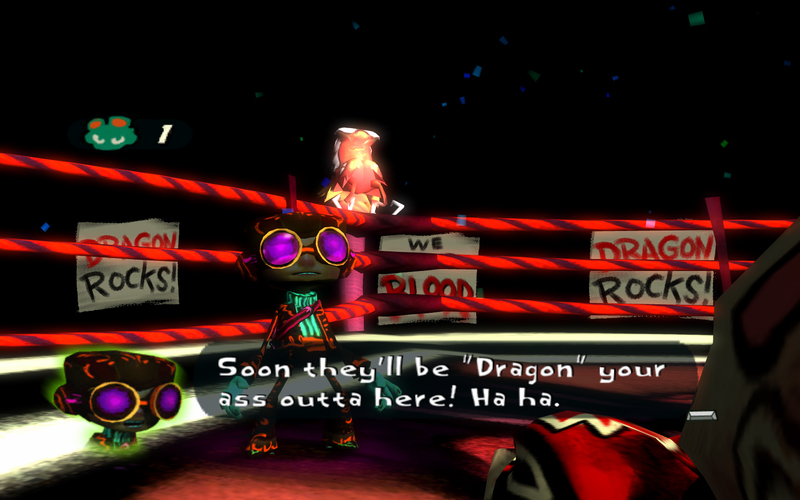 It is difficult to capture the humor of the game on paper without reciting the jokes, so the review will be focused mostly on interacting with the game and its world. Story: Since the biggest draw for the game is indeed the humor, as I have been increasingly stressing, I can explain the plot mostly like this: “Stuff Happens, just enjoy it”. Having read Dr. Seuss when I was younger, and accepted there were green-eggs and ham, I can take this game. But unlike a story book, where everything is presented in short whimsical chronological passages, Psychonaughts' series of plot events are sometimes bewildering, and not just because of the style of the game and humor. The player embodies Raz, short for Rasputin, who runs away from his parents and sneaks into a psychic camp to became a Psychonaught, something of a Secret Agent. However, despite sneaking in and given allowance to attend until his parents arrive to pick him up, a sinister plot begins to reveal itself. Someone is stealing all the juicy psychic brains of the camp. 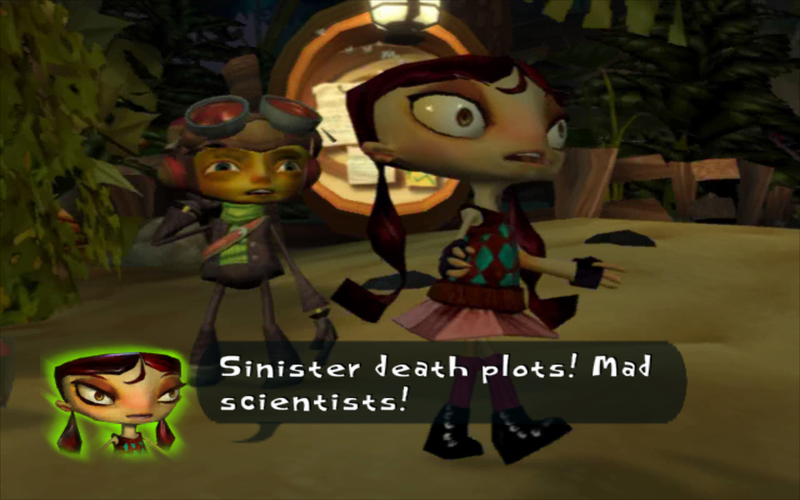 For some reason Raz is not affected by this, and he must venture forth to rid the world of the brain snatchers and prevent the world from being taken over by a physic army. That is the basis of the overall plot, and on its own it stands fine. The problem with the storytelling of the game, is that occasionally elements seem to just happen, and are not explained fully within the contexts of the game. 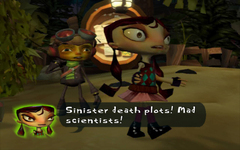 Otherwise, the cutscenes that do explain portions of the game, such as why Raz is afraid of water, appear to be played pseudo-randomly, or too late from the topic's introduction compounding the effect. 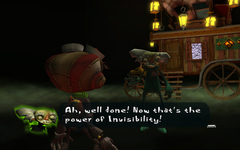 For example, a cutscene shows a watery hand rising up out of the ocean and waving to Raz. Before this though, I was seeing this hand grab at Raz as he jumped into the water. I did not know why, but attributed this to the cliché of adventure characters being deathly hydrophobic. Turns out, in a dialogue a bit after the cutscene, it is revealed that Raz's family was cursed by gypsies to die in water. At that point, it makes sense, but for constructing a strong connection, it might be wise to show the waving cutscene either before I had the chance to jump into pools of water, or by having the cutscene after the first jump in. Weather this was bad programming or intention, it felt confusing, and more like a gameplay element I was supposed to solve rather than a story-bit. Furthermore, looking at a Wikipedia article on Psychonaughts, there was a whole back-story about a meteor hitting what is now the game’s campground hub world, and the US government covering it up. I wasn’t aware of ANY of THAT, yet the game was just as enjoyable without it. 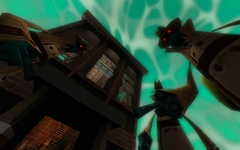 Gameplay: The game is controlled from the third person perspective. 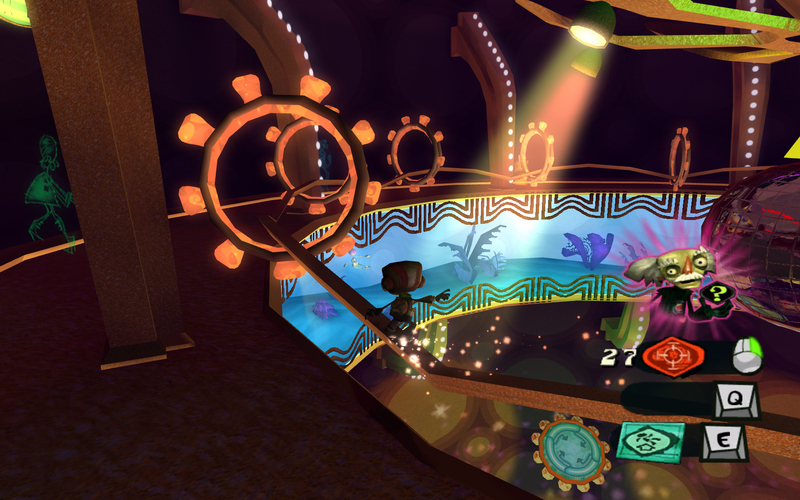 The player must jump around, collect items, and do most of the standard platforming elements. The initial levels of the game do a merely acceptable job of explaining collectables, another poor bit of storytelling. When you collect a new item, the game will usually describe it to you once through a popup, and that’s it. There are few tutorials and so the learning curve to find out what was meant is steep. Luckily, there isn’t too much penalty for trying things out, but for a while I was lost on what some items did, where they were meant to be found and how to activate specific events. For example, after acquiring the clairvoyance power, you are told that it could be used on objects to find out their usefulness. However, I didn’t know that you had to have them in your hand to mind read them, and was constantly trying to “activate” them on the inventory menu, where it showed the clairvoyance icon over each item that I had not yet read. Furthermore, the beginning of the game throws a lot of elements that need to be collected, cobwebs, figments of the imagination, gaining Psi Ranking levels and lost baggage within a short time frame. By the end of the game I understood what these meant, but it wasn’t clear by the explanations in that first level alone how they would prove useful to me. I.E. Gaining levels grants new power, though I didn’t know this until a picture of a man appeared in my HUD, with another brief message telling me to meet with some guy. Wait… where is this guy, WHO is this guy? Beats me, the game just throws you out in the camp, and expects you to know where places are. 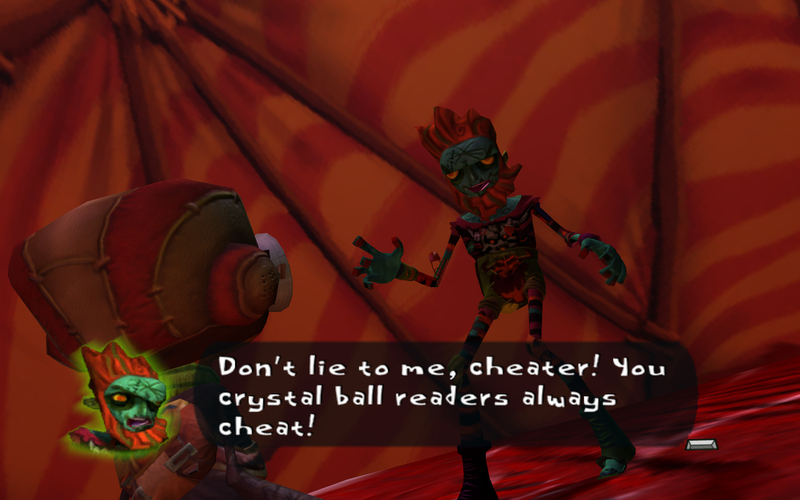 The tram system is well appreciated, but for most of the beginning part of the game, I hadn’t even been introduced to the characters to know their names, none the less, go to their headquarters to learn new powerups form them. Going back to the storyline inconsistency; this character I was supposed to meet with, Agent Culler, appears as many different personas around the camp, and only when you meet his “real” self do you get what you need. Once more, the game doesn’t introduce you to things in a gradual manner; perhaps it has the allure of games of old that expected you to explore for hours. The camp serves as a hub world, and there are few if any main quests on it. Once you get the hang of what items do, and what things are, the game flows much better, becoming more predictable in its direction. 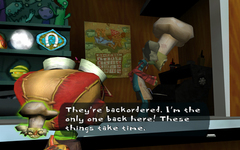 The latter half of the game throws Raz into the mental zones of a couple characters, and rarely will Raz spend more than a couple minutes in the “physical” world once that point is reached. In this way, the beginning of the game is a tutorial that calls itself a game, and the end is the actual game. Going into character's minds is a treat, as each zone has different theme, and style to them. One zone may have you crushing buildings, with little if any jumping around, while another may have the player tight-rope walking as much as possible. In addition, in one psyche the developers even threw a rudimentary RTS in the mix. You will look forward to seeing what the next environment looks like, and seeing how it will play. This keeps the gameplay fresh until the end. As for items in the game, I can't help but be reminded of Banjo Kazooie, an N64 game from the past. While there aren't "notes" and jiggies, there are quite a few substitutes and complimentary items. As Raz collects 100 figments his PSI Ranking increases. At every 5 or so levels, Raz is granted new abilities and powers. Most of these powers are mandatory to complete the game, but I had no difficulty collecting enough to advance the game, requiring no replaying of past levels. Another way to increase the PSI ranking is by the collecting of mental cobwebs with a mental cobweb duster. This collectable was not quite as rewarding as collecting figments, which came in a variety of entertaining shapes depending on the mental level (think Inception) you inhabited. You just took out your cobweb duster, sucked them up and that was it. When you had enough, they could be redeemed for levels. The cobweb duster is unfortunately mandatory to complete the game requiring yet another currency. Arrowheads are redeemable from the camp cabin (Where is that, have I been introduced to it?). Most of the items bought are not necessary to complete the game, but the cobweb duster is, and it is pricy. To collect arrowheads, the player must walk around the campground and press the Use button over a shimmering patch to get one. The player may also choose to get a arrowhead detector, allowing the finding of large patches of these arrowheads at once. I guess you could find the arrowheads one at a time to get the cobweb duster, but it would take a patience that would kill the game for most average people (And probably anybody who bought this game on a $2 budget). Collecting arrowheads is boring, and using the detector is only remotely more interesting. Thankfully it was a minor collecting quest. Only Two ways to get PSI Levels? No, Raz can also find PSI Cores and psycards. Just like the plethora of collectables thus far, making the game seem more like Dinosaur Planet than a Mario clone, they are collected separately. 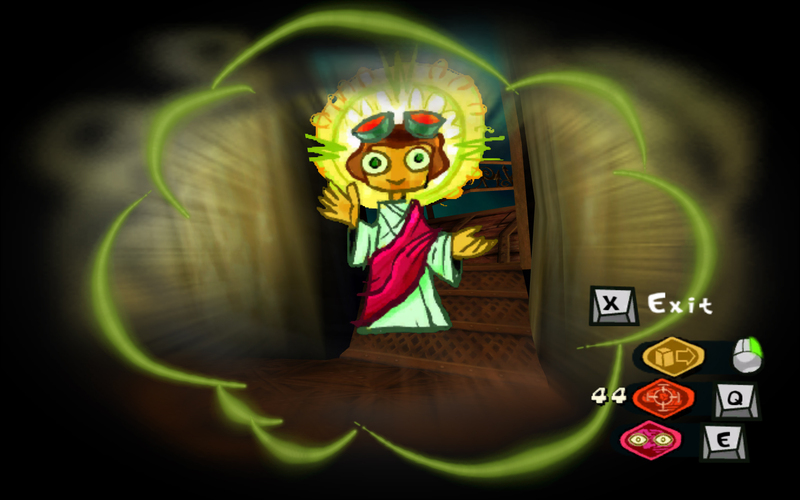 Once a certain number of psycards are found, and a core is held, these can be transmogrified to become a PSI level. I found this method to be the fastest and easiest way to gain levels, yet the figments were definitely the most fun. For those that LOVE to collect, if you bought this game, you sure must, and are tired of solving people’s problems. you can also play a scavenger hunt around the camp. Find the items and gain some PSI Ranks. I did not do this, but the ones I did find did not just fall into my lap. Lastly, purely for entertainment collectable are the lost baggage. By finding keys (OMG so many collectables) and the corresponding baggage, the key must be held first, the player gets one step closer to unlocking secrets about the person’s psyche. The player must however collect ALL the lost baggage! Now that you a lulled to a coma with the fear collecting so much stuff, you might want to hear about the Psi-powers. Psi Powers: The greatest part of this game, besides the humor, are the psi powers. Each is filled with character and are useful too. Take, for example, Pyrokinesis, the ability to set people on fire. On its own it isn’t largely useful for killing enemies, but use it on friendlies and wild animals and you find yourself laughing. 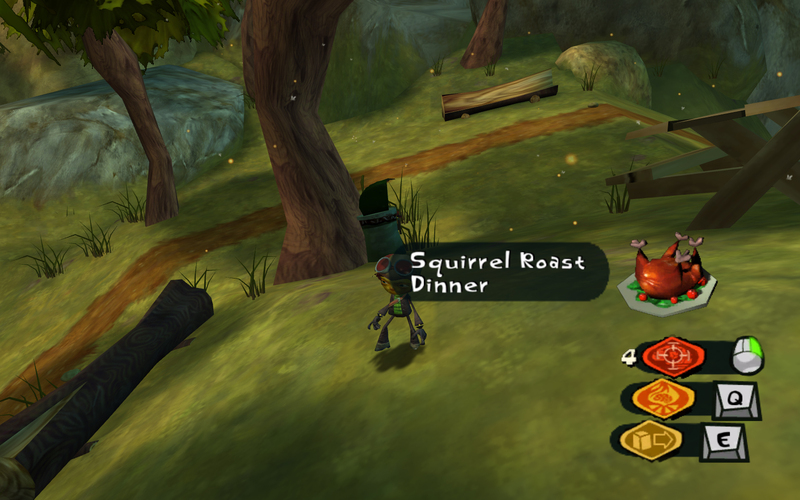 I can’t say I’ve had the ability to collect roast squirrel, collect the plated meal and eat it to regain health before in any game. Just discovering things such as this are a testament to the strong stylized design of the world the characters live in. In fact, whenever I unlocked a new mental power, the first thing I would do would be to go around and use it on my friendlies. Friendlies don’t get injured, but each person has dialogue specific to their character depending on what attacks and powers you use on them. I won’t spoil it for you, but just wait until you see how the world sees you when using clairvoyance. Sadly, besides the humor aspect, all the powers are relatively useless for combat. I found myself resorting to the basic smash, and maybe telekinesis when it was required. Only when the game required a specific power to defeat a boss did I pop open my PSI powers menu and choose some other powers to aid in the fight. Just a note, not all the PSI Powers needed to complete the game are earned through PSI Leveling, some are found in levels too, so don’t freak out too much if you find yourself on a level, and you need a certain PSI power that you don’t yet have. 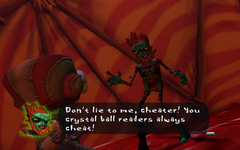 During one portion of the game, you are told you need a PSI power, but it doesn’t emphasize that you can find it on that particular level, another design flaw. Controls: The game’s controls are your worst enemy, greater than any monster. The ace of destruction and annoyance, you will find yourself wondering how to proceed through the game based on the inadequacy of the controls alone. The camera control is done by that fine instrument the mouse, proven over many FPS to be a sensitive and reactive tool. The keyboard, specifically the arrow keys/WASD have not. The era of playing FPSes with D-Pads and 4 buttons and all 3D endeavors that require being able to hit a target between 45° and 90° is gone. Raz is moved by the arrow keys. Alone this wouldn’t be suitable at all, being able to run only in 8 directions in a 3D world, but there is hope. That mouse tool that moves the camera, that is the secret, by combining the movement of the camera with the discreteness of keyboard movement, the game can move in all directions. But let me pose another situation to you, two full pressure sensitive controlling axis, too bold? Well the consoles have them, and the PC does not. Here lies the problem. For a console platforming game at heart, the controls occasionally shoot outside the target. I was quite apt at controlling the game’s camera with the mouse, and only really using the front and back arrow keys to move Raz around, like a first person shooter, but there were still times when I would miss the mark. In one case, I might angle the camera so that Raz would jump the correct way and I would lose the depth to figure out how long to push Raz forward. The game also loves its tightropes. Each time Raz would cross a tightrope, trying to catch it by strafing was almost a guaranteed 10 meter drop to repeating a segment of the route. Instead, I would align the camera so the rope moved into the camera, and then jumped forward. This method was effective though doing this thorough the entirety of each level made its usage tired. If you are playing with a controller, consider yourself lucky, since you are likely immune to half the problems I’ve listed and are going to list shortly. The second biggest problem for the PC controls are inventory. “]” will bring up the inventory, but for a while I didn’t even know of the existence of the inventory except I needed to use an item and the game wasn’t handling it automatically. Selecting items isn’t so bad, but it is obvious it is a console port. Instead of selecting something with your mouse, you have to select the direction of the object on a Crysis-like wheel and then press the equip button. You’d think this isn’t so bad, but the reason Crysis used the mouse for it becomes headache-inducingly obvious. Pushing two keys at once is required to make diagonal angles, but unlike a D-pad, the PC uses buttons. Letting off of one of the directional buttons, even slightly before the other, when attempting to do a diagonal and the game will assume you meant one of the two buttons. This made it infuriatingly annoying to select items that happened to be in corner pockets. What-more, no amount of control rejiggering would be able to remove that issue. See the manual for more of the controls. Since I’m reviewing the PC version, let me tell about some displeasure at changing the PSI powers around. PSI powers are on a similar menu as the inventory so what I stated above still applies. 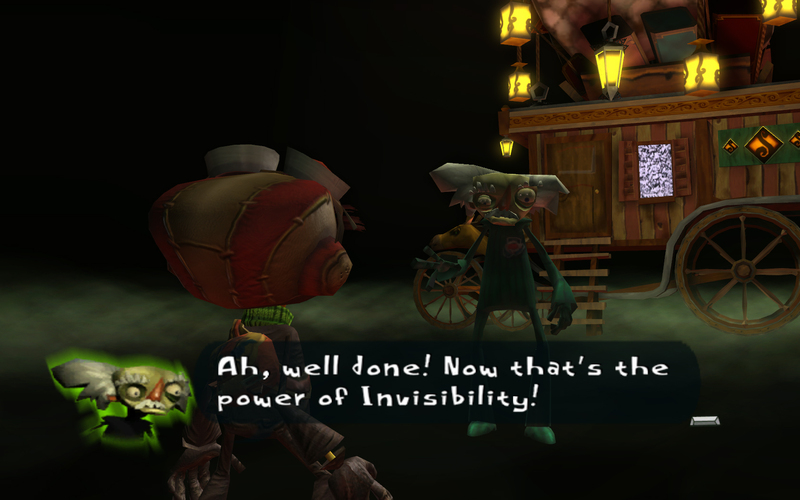 Raz can only have 3 psi-powers equipped at any one time. This makes sense on the console versions with limited button real-estate, but the PC versions has many empty buttons clambering for a slight stroke every now and then besides by accident. Here’s some suggestions, take a bite from an RPG and make the number or F# row quick access to specific psi-powers. The 3 specified powers can remain, but anything that removes the need to choose powers on the annoying selection screen is a bonus. Not withholding, the “m” key should bring up the map. Why must “esc” bring up a general menu, and then I have to slide over to it and select it on a separate menu. Graphics: The game has surprisingly good graphics for an Xbox 1 port. Perhaps this is the nature of the high resolution I was running it at, but I find the textures to be clean when they needed to be. What-more the characters and objects did not look blocky, unless it was in the nature of the character. 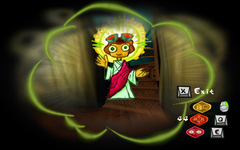 The style utilized through the game, something of a mix between a painting and the Dr. Seuss mentioned before, allowed the graphics to outlive many games from that era going for a more realistic projection. I love little details. A couple that caught my eye in the graphics department include the figments of the imagination mentioned before. These are shaped depending on the personality of the person's mind that Raz is infiltrating. 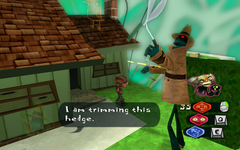 There are a lot of shapes and sizes to these figments, and the notable ones would even give tips as to where to go in a level, showing a figment pointing or holding on a rope. Unfortunately, since they are meant to be blurred and wispy appearance-wise, the increase in resolution for the PC version hasn't been quite as kind to them as overall texture elements, but is wasn't too bad. 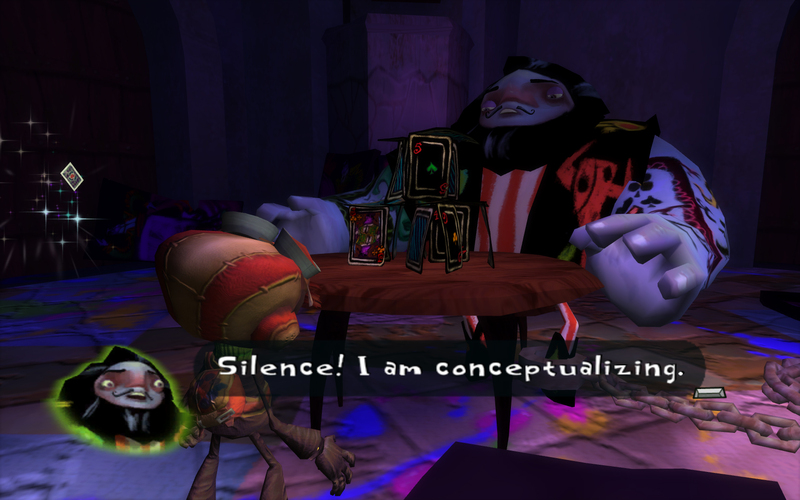 Another great little detail is later on in the game, when Raz is in the mind of a painter, who's mind is engulfed in Mexican culture and lucha libre lore. The world is vibrant in neon colors, glowing above the normal pastels. Even Raz gets a new re-skin by entering the world. The detail, and style immediately sets the player in the game world and the idea of dogs painting roses, and bulls racing down the street immediately makes sense. In this world Raz has the opportunity to be kissed by a women behind closed doors. (Among other things?) The develops don't just imply Raz is being kissed, as hearts flow out of the window, as he emerges, lipstick stains dart Raz's face and clothing. Attention to detail, keeping with the style that's what I like. Raz can't step in water or else the hands will get him. What about underwater? Well, when you do go under the sea for a trip, you'll find that the hands will wait outside Raz's air pocket, waiting to reach in and grab him. I was not expecting this, and it was a strong attention to their plot point that I was surprised to see. While almost cosmetic, as the story progresses, the campgrounds goes from day to night. Appreciated only for the added sense of urgency that Raz only has the weekend to complete his mission to become a Psychonaught. My biggest complaint with the graphics was that the cutscenes were pre-recorded videos rather than in-game cinematics. You might be wondering why this matters. Well, the videos are limited in their stored resolution, while in game runs as whatever the engine will allow. This means running the game at high resolutions results in cutscenes that are noticeably blurrier, and detract from the immersion. I can understand that perhaps the developers needed to make the cutscenes into movie files to pull off graphics that the engine running on the Xbox could not handle. This is a PC version, and the appearence that both the movies and in game use the same assets; I would have liked for the cinematics to be rendered in real-time rather than another port checkmark. Sound and Music: In a word bueno. The voice actor quality is outstanding, and each character’s personality, thanks to Tim Shafer’s witty writing, is only boosted by the skilled actor reading it. What-more, the syncing of the mouths, while seemingly a small aspect of a cartoony game, is well done, with the mouths flapping away in rhythm. Given that characters often have multiple things to read depending on your contextual action with them deserves even more praise. Furthermore, sound design was sound as I did not feel that any choices were out of place. 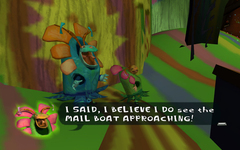 A specific noteworthy voice acting/programming job was Boyd the Milkman. His lines are naturally memorable, but the better of them is the random generator. Someone went ahead and recorded a bunch of lines, and decided rather than have them read in a specific order, they would shadow the randomness and stuttery speaking of a lunatic. 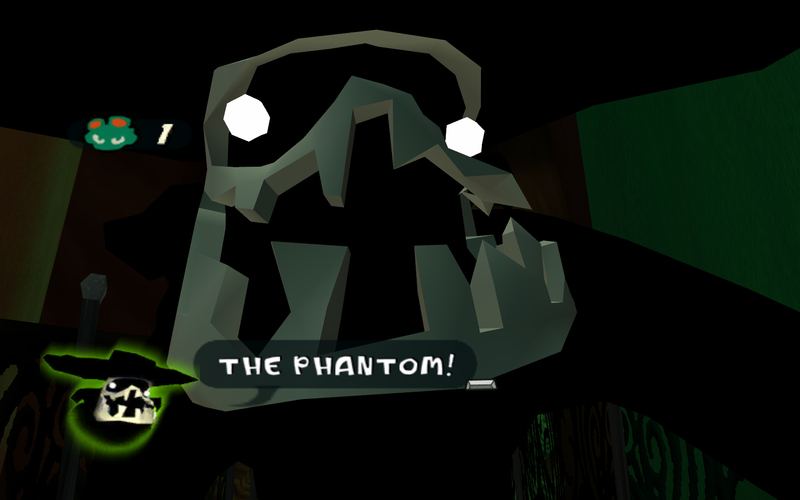 The game will play lines from the character's mouth to form sentences that shouldn't even be together. The Squirrels?! They did it? No wait the five richest families in the country? Listening to this character speak brought back memories of typing to artificial AI and the seemingly oblivious responses they would contribute to the conversation. As for the music, occasionally good but too repetitious. Unlike some games that go for atmospheric sound, Psychonaughts goes for the repeating background music. On some levels this is fine. Other times, I'm looked for an opposite word that rhymes with bo. Two very specific levels which's levels made me want to turn off the hurt were a Napoleon based one, and a Play. For the Play production, I'm fairly confident that the music director wanted the music to be overly bubbly, and representing of the happiness of the amateur production. For that they succeeded, but it is WAY too obvious. On that level you can turn the stage to one of two forms, playing a different song for both. This makes the music selection worse, as the user constantly hears the start of the two songs, over and over, and over. The songs are not horrible (I even have one set for a ringtone), but their presence and conditions are too widely met. The Napoleon's issue lies also in its repetitiveness. Hearing the 1812 overture remixed is only good for so long. Not to mention the level is filled with torturous platforming means the hate has to go somewhere. I think for games like Super Mario, having only a select number of tracks is cool, because the levels are short and catchy. For Psychonaughts, the levels are just too long for their respective songs, which themselves are too obvious. Since the songs don't change very often for most levels, that you can be on for over an hour, you hear the songs repeat far too often. The music overall is good, listened to outside the contexts of the game. 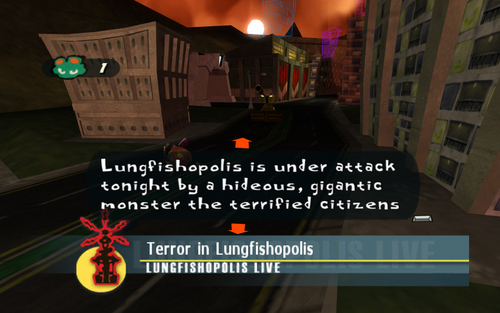 Each is imbibed with style as strong as their respective graphics and level themes. For the luchador one, the music has that Mexican flair, and for the rave party, there is a techno beat. The camp grounds have a classical guitar that makes one remember their times around the campfire late at night, one of my favorites in the game. Humor: For some games, the cutscenes and story are what make the game worth continuing. Others it is the gameplay. For Psychonaughts, the game is the medium to reach more of the jokes, for they will keep you playing. Raz will be exploring the minds of many characters, and the Idiosyncrasy of each prep for the dramatic irony that is bound to come. The cleverness of the writing, of jokes not story, can't be denied. Compared to TV comedies it is similar to The Simpsons than Family guy or South park, with weird situations leading to more weird situations. The jokes also tend to be subtler than a comedy such as Airplane that makes jokes every 30 seconds. You won't be laughing out loud most of the game, it isn't like that, but the develops setting up a situation you wouldn't have imagined, or pushing the bounds of dullness, the overall facetiousness is exemplary. The game also makes a lot of use of visual gags, not all working well. One particular bad visual gag had to do with timing, holding hands with poor storytelling. 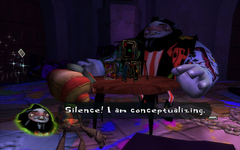 Raz is talking to another character, and we see various items being thrown out to catch their attention, except in the scene, it doesn't seem to fit. While the items attempting to angle the pair are peculiar and noteworthy, I wasn't sure why this was happening as a proper villain had not been fully established. When it was revealed there was a giant evil fish, it made slightly more sense, but I couldn't help feel as though they should have made it more apparent that it was a fish ahead of time, or at least a faced villain. A stashed enemy who tries to lure children with a fishing rod, that could be offbeat and funny as long as it was played up right. In this case, I felt the situation could have been done better. Conclusion: For less than $10.00 Psychonaughts is a steal. While you have to deal with some controls issues, you can, at minimum, change the button configuration. It doesn't fix the accuracy of the keys available but you can play it with a controller pad, highly recommended. The voices are good, and the sounds feel right. The music is quite good, but overly repetitive. 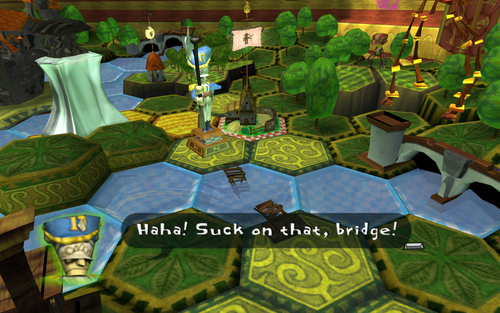 Gameplay is a mix between standard 3D platforming, coupled with collecting everything you can get your hands on. The changing environments filled with zany humor and character quirks will keep you motivated to progress through the levels. Gaining new Psi-powers and Psi-levels add reasons to go back to old levels, and allow Raz to execute new tactics from stage to stage. There is a bit too much to collect, but much of it is optional, and the develops have a fine balance between required collectables and extras. The storyline and introduction to concepts are not properly introduced much of the time, but take it as a means to set up jokes and just flow with it, and it won't destroy the game. Graphics are good for PC, but like the controls, have evidence of being ported from a console. 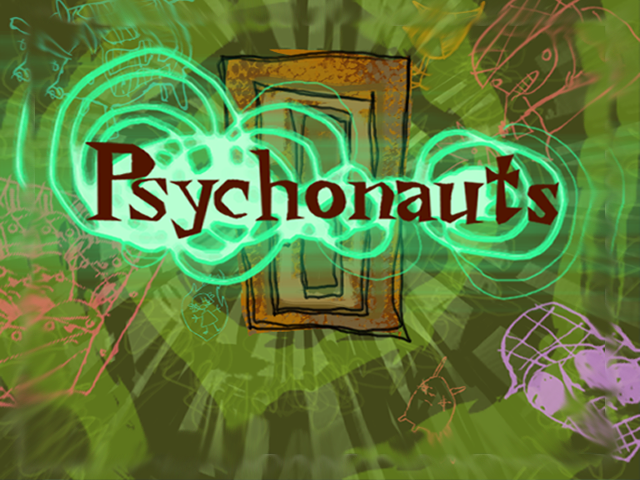 For those of you that are interested in saving your games for Psychonaughts, especially considering there is a limited amount of save slots for your usage the save game directory is "…/Psychonaughts/Profiles/Profile 2" The ellipsis depends on where the game is installed. My copy was from steam so it was "D:\Steam\steamapps\common\psychonauts\Profiles\Profile 2". Notice that the folder only has 6 saves in there. It is a little bit of a shame that the game could not have automatically backed up the older saves, 200KB is not that much space, even for a hundred saves, unlike Deus Ex.